INDUSTRY.co.id - Sukoharjo - Entering the age of 51 years, PT Sri Rejeki Isman Tbk. (SRIL) succeeded in establishing its position as a leading national garment and textile company with various prestigious awards, both national and international. In a speech commemorating the anniversary of PT Sri Rejeki Isman Tbk. The 51st in Sukoharjo today, President Director of PT Sri Rejeki Isman Tbk. Iwan Setiawan Lukminto some of the awards are obtained this year and in 2016. "In the past year PT Sri Rejeki Isman Tbk. Successfully listed as the best 40 companies by Stock Analysts, and also as Top Ten Blue shares in Indonesia Stock Exchange. While this year we won the Best Emiten by Analyst Section on Yuk Nabung Saham program initiated by Indonesia Stock Exchange, "he explained. Iwan Setiawan said the award is inseparable from the performance of the company that has assets of US $ 947 million and has posted sales of more than US $ 680 million in 2016. 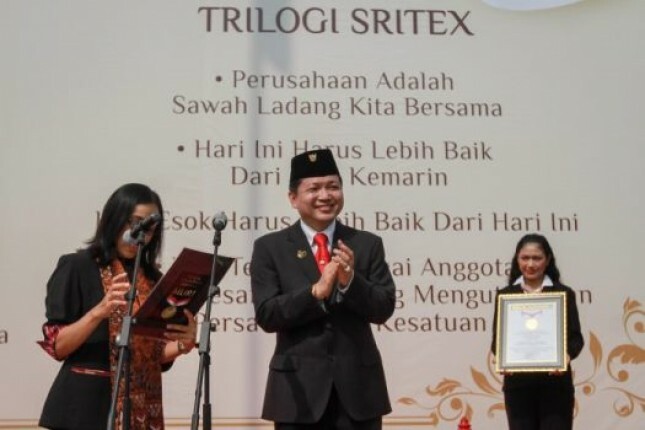 Currently, Iwan Setiawan said, SRITEX Group's products range from Yarns, Greige fabrics, finished fabrics, Fashion products, Corporate / Government uniforms, TNI / POLRI uniforms and Military uniforms to more than 100 countries worldwide. The development of new value-added products will also continue to provide the best products that our company's customers need. "SRITEX Group continues to develop and conduct high-tech research to produce excellent products that have capabilities such as anti-water, anti-stain, anti-fire, anti-insect, anti-bullet, and anti-radiation," he explained. Iwan Setiawan said that compared to some domestic competitors, PT Sri Rejeki Isman Tbk is still the market leader in the first quarter of 2017 with a total sales of US $ 180.2 million. "We see the national textile industry as a whole will still increase, especially considering the tendency of increasing labor costs in China and some labor constraints in Bangladesh, so Indonesia is preferred by investors," he explained. Southeast Asian countries, said Iwan Setiawan, contributed 9% to the global textile market share. While at the level of Southeast Asia, Indonesia contributes 30% to the market share of textiles. Indonesia's textile export performance, said Iwan, over the past few years showed an average increase of 7.9% per year. Iwan Setiawan said that this year, PT Sri Rejeki Isman Tbk's management plans to implement several business strategies in order to achieve sales target of US $ 734 million to US $ 762 million, with a net profit target of US $ 65 million - US $ 68 million. "Some of the company's strategic plans in 2017 include normalization for new product capacity, operational efficiency and production, value-added product innovation, human resource development, and strengthening capital and liquidity structures," he said. The management of PT Sri Rejeki Isman Tbk, said Iwan Setiawan, will strive to maintain and improve the performance and financial condition of the company. During 2016, he explained, several indicators of the company's financial condition showed encouraging results. If in 2016 the company's assets reached US $ 947 million, in the first quarter of 2017 then the company's assets increased to US $ 1.105 billion. Meanwhile, the company's total equity rose from US $ 276 million in 2016 to US $ 349 million in the first quarter of 2017.